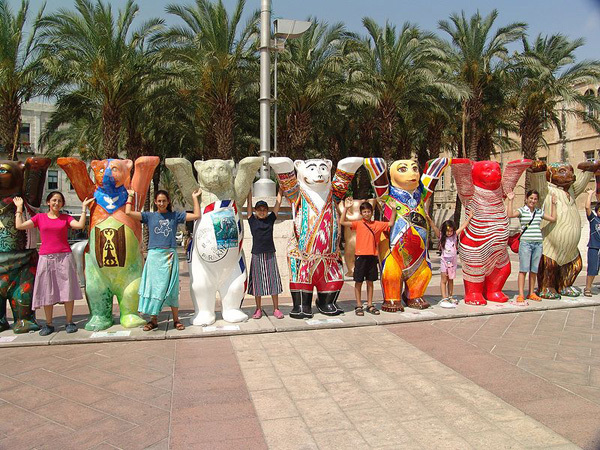 We're happy to say that several more Buddy Bears have been sent for our latest contest. We sure hope that all of Jackie's loyal fans will be sending in a design soon! This is Infinity Bear and he stands for friendships that last forever, and is made of scraps of coloured paper, card and material that would never have been used to make something worthwhile anyway, bringing together these neglected materials, like neglected people coming together. 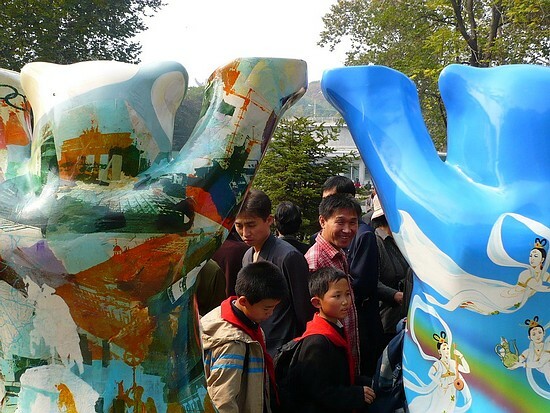 We're sure that Jackie will love what her bear stands for. As you know, Jackie is very conscious of the environment and the idea of a Buddy Bear made of recycled scraps is right in keeping with his philosophy. Thanks Vic! For those of you who haven't sent in a design, click here to read about how to do it. Click here to see the latest entries. Our Buddy Bear contest is off to a great start. Thank you to everyone who has entered so far and thanks for following the directions for naming files, sending addresses, etc. It makes the webmaster's job so much easier! Eva Herlitz has sent us photos of the three Miniature bears that are being given away as prizes. Click here to have a look. Note: If you were one of the winners of the blank Buddy Bear in our last contest, please send us a photo of your custom painted bear. We'll post it here on the Kids Corner! Recently at the Fan Party in Beijing, one of Jackie's Russian fans presented him with a painted portrait made by her friend Asha. We asked Asha to send us a picture of her painting so we could display it in Jackie's Art Gallery and she was nice enough not only to send one picture, but three! 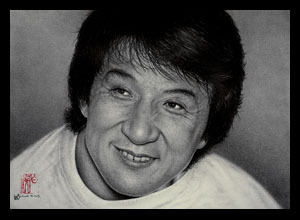 Take a look at our art gallery to see many beautiful drawings and paintings by Jackie's fans. 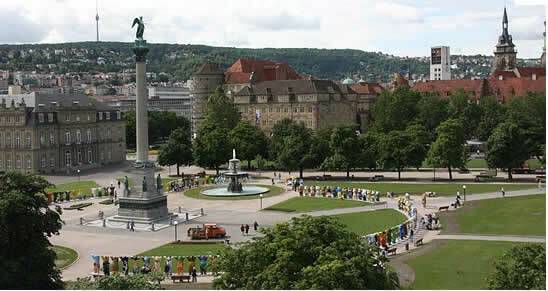 Anyone is welcome to submit a drawing for our gallery. 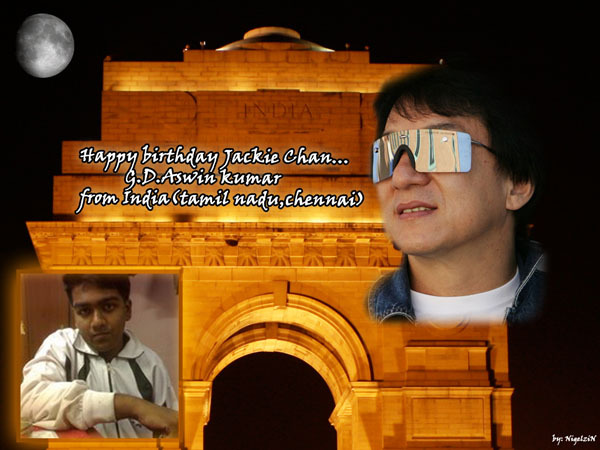 Just scan it and send it to jckids@jackiechan.com . 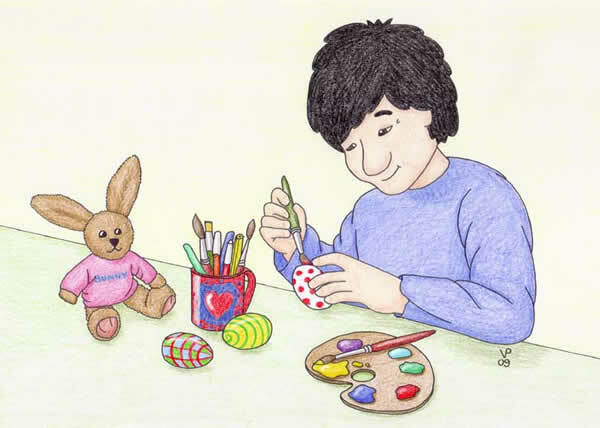 Click on Jackie and Matthew to see all the beautiful pictures in our Art Gallery. What's Up With the Buddy Bears? Mrs. Herlitz has agreed to provide prizes for another Buddy Bear contest. We will announce the prizes at a later date, but in the meantime, why not start designing your Buddy Bear? Details about the contest (including deadline and prizes) will be be posted here as soon as we have them. 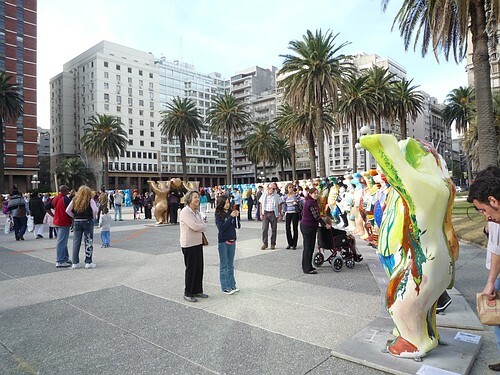 If you're not familiar with the Buddy Bear project, click this link and read all about it. 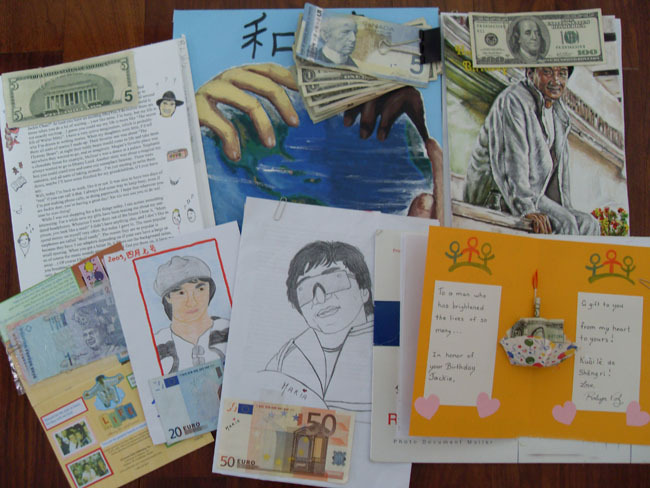 Well, it took a while, but as we promised we are posting photos of Jackie with the many cards and letters sent to Hong Kong for his April 7th birthday. Jackie was so happy that he even took photos of the cards and letters with his own camera! 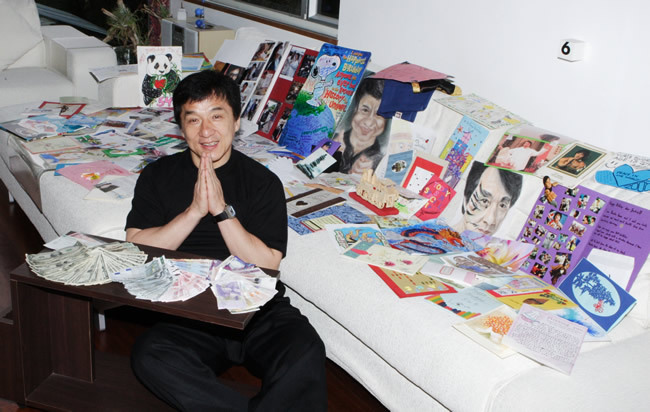 Fans sent a total of US $726 for Jackie's charities in honor of his 55th birthday. Jackie wants his fans to know how much their continued support means to him, especially in these difficult economic times. Thank you!! 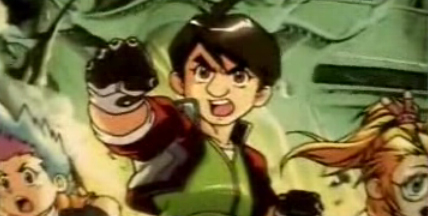 How many of you remember the Jackie Chan Adventures cartoon? It was (and still is) a very popular cartoon series featuring Jackie. Although it is no longer being made, many television stations play reruns of it and the entire series is available on DVD. Well, now there's a new animated cartoon series which was introduced at the China International Animation Festival! The name translates as "Jackie Chan Fantasia" and it is a cartoon series by one of Hong Kong's master animators, Huang Yulang (who also happens to be an old friend of Jackie's). The series, which is in Chinese, will feature Jackie's character involved in story lines which will teach youth respect, friendship, and other important moral lessons. If all goes as planned, the cartoon should debut in late 2009 in China. And who knows? Maybe someday someone will translate it into an English version! If you'd like to see what it looks like, click here. It's spoken in Chinese, but it's interesting to see even if you don't understand what they're saying. 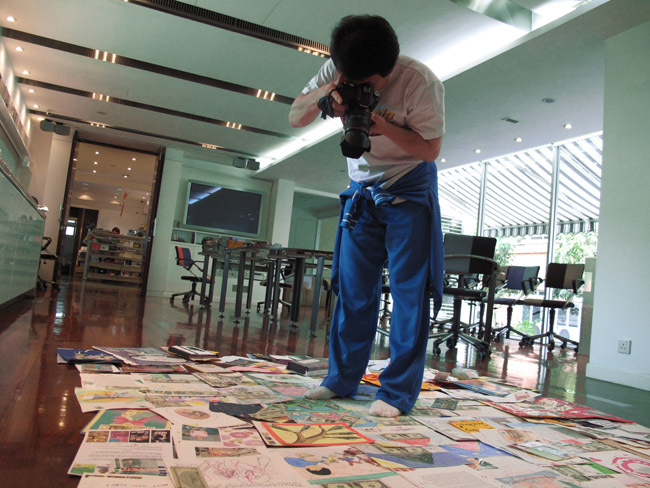 You also get to see Huang Yulang talk about the cartoon. 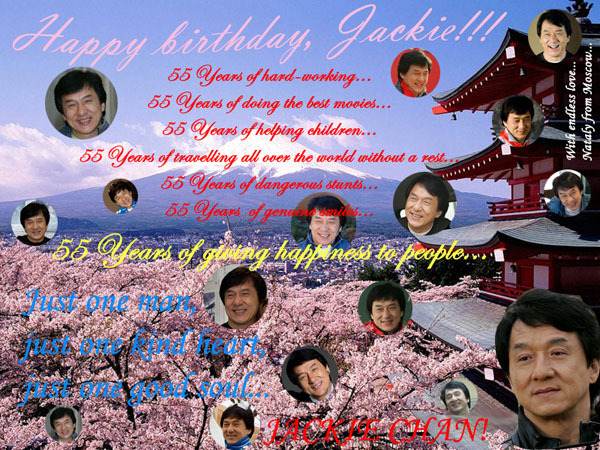 On April 7th, Jackie celebrated his 55th birthday and many fans sent in lovely cards and wishes. We will post a photo of Jackie with the cards as soon as we can get him to stay still for a picture! 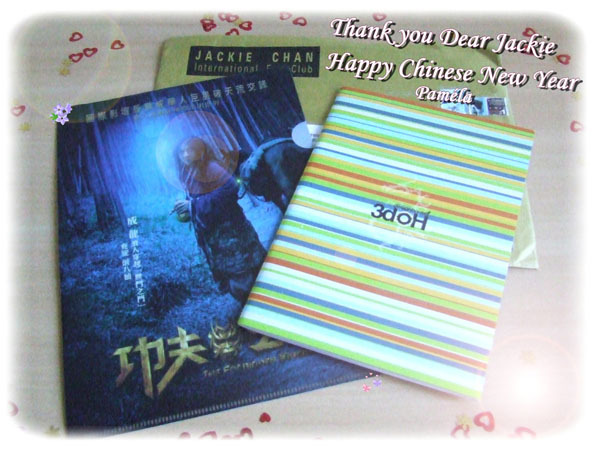 Many fans also included donations for Jackie's Build a School for a Dollar. 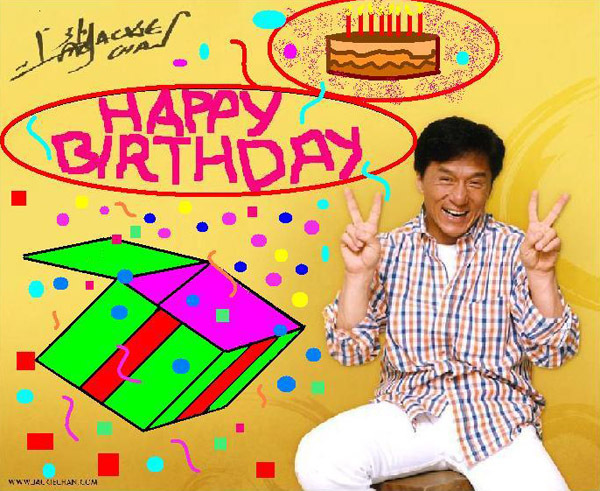 This year, a total of US $726 was sent in for Jackie's birthday. Sadly, this is nowhere near the usual amount that we receive for his birthday, but it's understandable because many people are having financial problems. We really appreciate every dollar that is sent in, especially during the hard times. Here's a photo of some (but not all) of the recent donations. We have other cards and letters that we will show later (when we get Jackie to pose with them). Thank you so much to everyone who has sent in a donation! 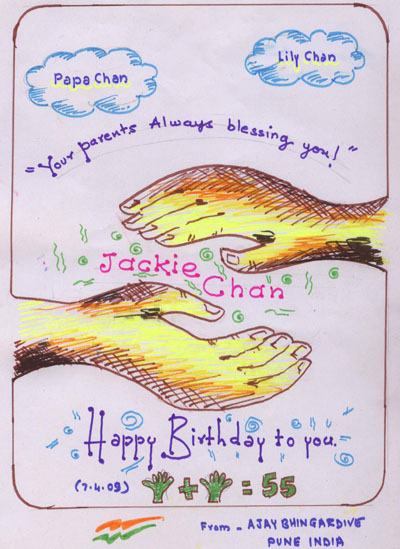 A big thank you to all the fans who continue to support Jackie's Build a School for a Dollar project. We know that times are difficult right now and that is why we are especially happy that fans sent in US $634 this month. With Jackie's matching donation, that brings the new total up to US $54,864 !!!!! You can see some of the newest donation drawings at the Build a School pages here. We also want to thank the people who donate online at our secure donation page. We know who you are and we appreciate you! Some people have been making small (and large) donations monthly for several years now and we want you to know that we are happy to have your support. 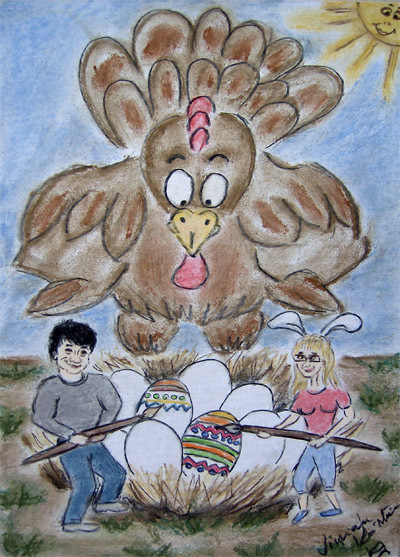 Please take a look in Jackie's Art Gallery where you will find beautiful drawings sent in from fans of all ages. 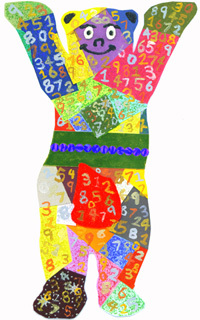 Click on Bai Wei's drawing, below, to visit the Art Gallery. Asha from Russia won an autographed notebook in our New Year's contest. 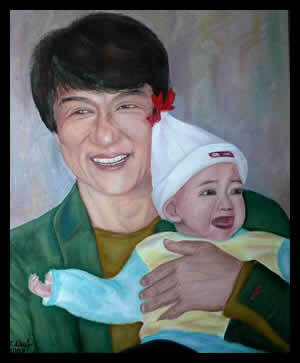 She sent this photo to show us her thanks....and to show us the beautiful portrait of Jackie that she painted! Thanks Asha. 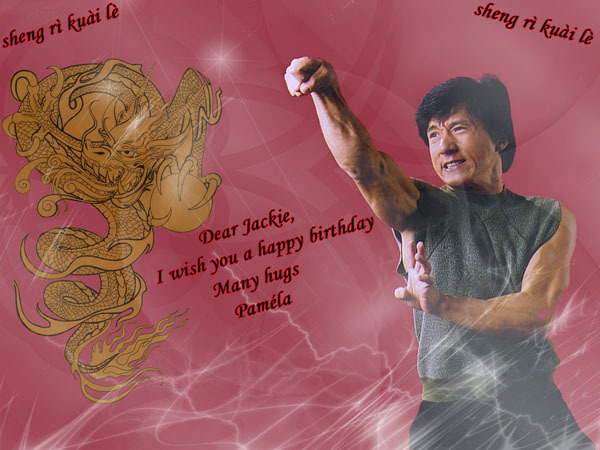 A birthday greeting for Jackie from Pamela. Pamela sent a thank you for the New Year's prize. 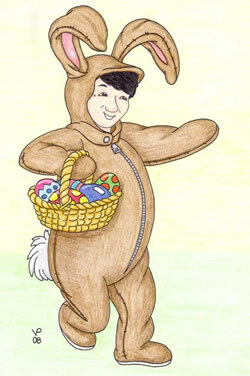 Don't forget about our beautiful Easter project from Petra (see below). 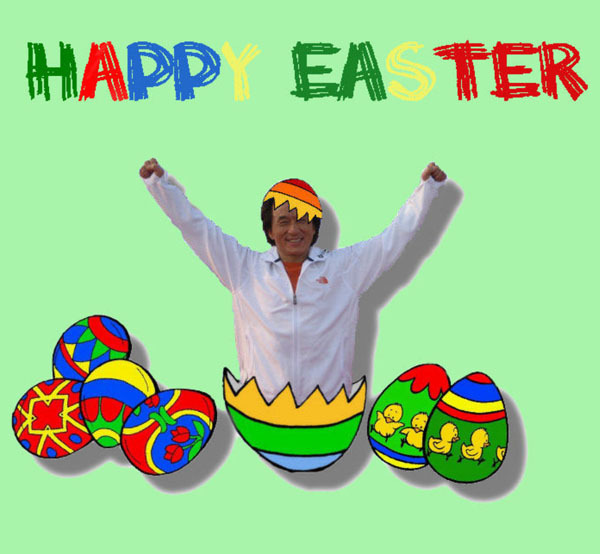 You can print one on your home printer and color it in for Easter! 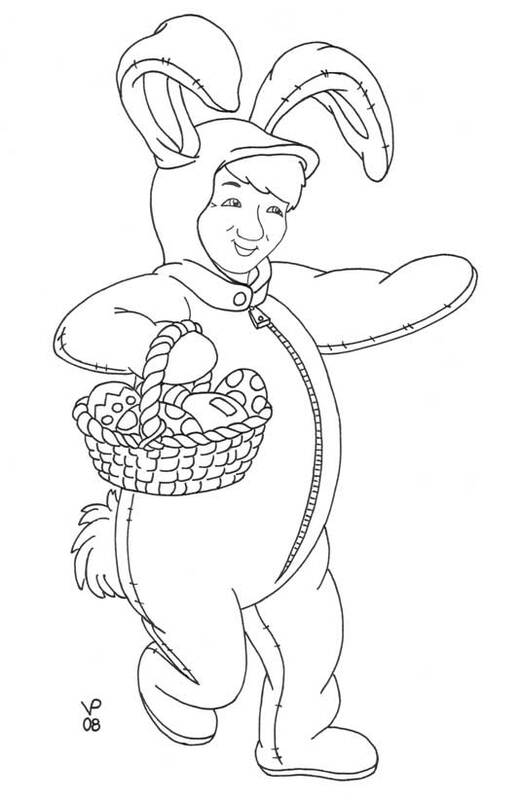 There are lots more coloring projects on our website. 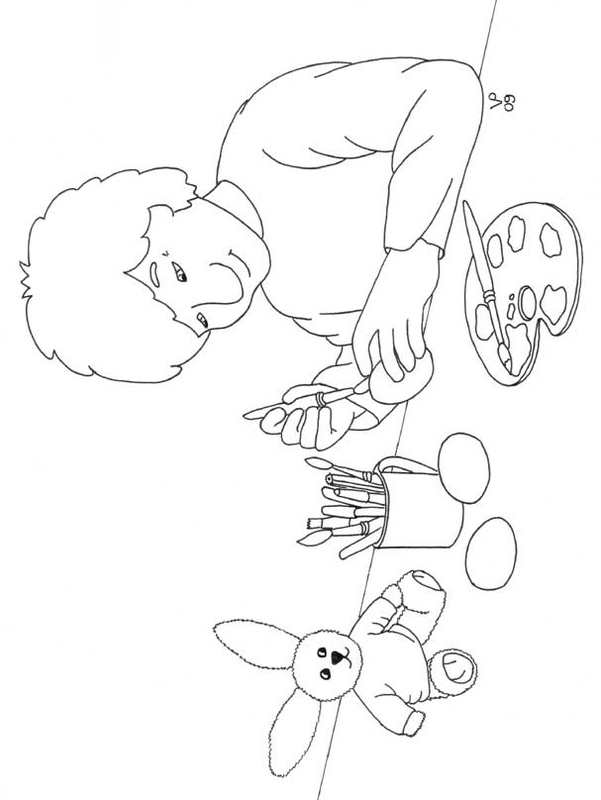 Just visit our Fun Stuff section to find links to our coloring project pages. As you might know, Jackie spent some time in New Mexico at the end of last year to film The Spy Next Door. We think that all of Jackie's fans will like this movie and want to especially encourage his young fans to read about what it was like filming in New Mexico. There are lots of photos in Jackie's diaries about the trip and you can also read the first Scrapbook article and look at Jackie's Albums from Santa Fe. 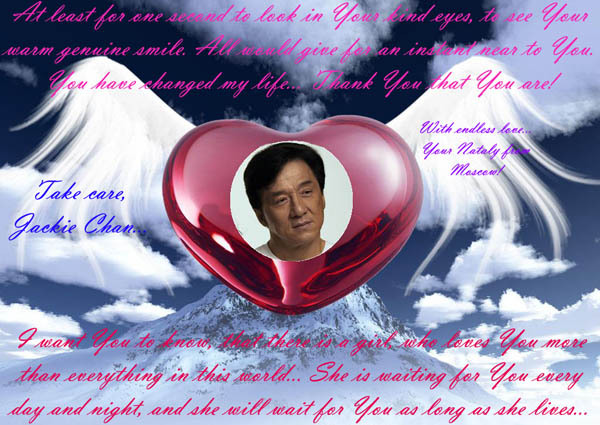 Visit www.jackiechan.com and find the New Mexico Diaries in October, November, and December 2008. The first Scrapbook article is here. 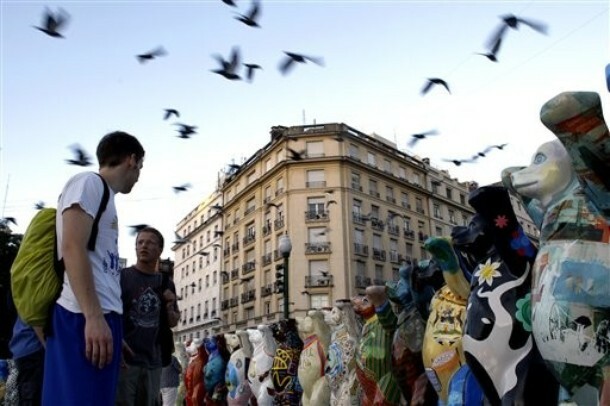 The webmaster is working furiously to finish the second installment of the On the Road article about filming the movie. There are going to be many new photos to see, so please check the main website often for updates. 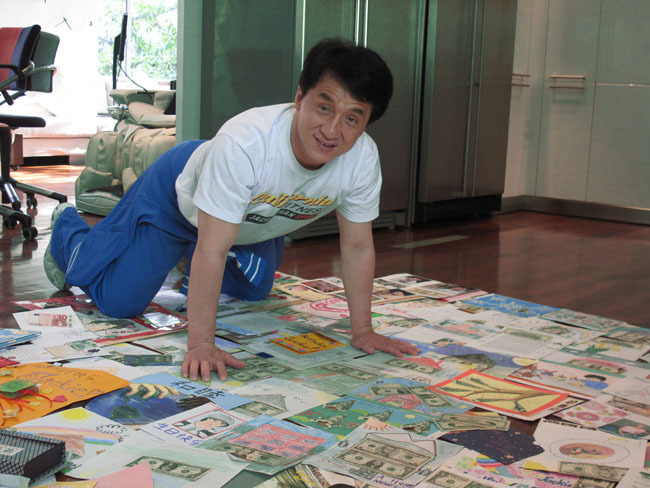 Last year, Jackie's fans sent in a total of US $2,378 for the Build a School project in honor of his birthday!